Media captionLabour leader Jeremy Corbyn: "I'm angry and fed up"
Labour has said it still backs the UK's Trident nuclear weapons after Jeremy Corbyn said "all aspects" of defence would be reviewed if he won power. The case for renewing Trident was still being discussed, the Labour leader told the BBC, prompting Tory criticism. But a Labour spokesman said it remained official policy to keep the deterrent. In the interview, Mr Corbyn said he wanted no more air strikes in Syria but did not rule out a drone strike to kill the leader of so-called Islamic State. 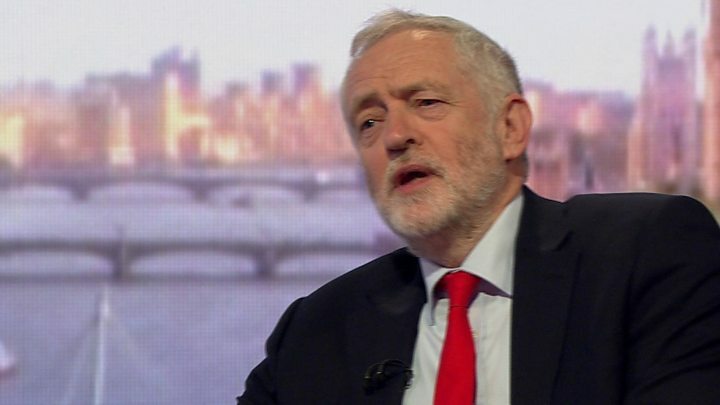 Speaking to Andrew Marr on BBC One, Mr Corbyn - a long-standing opponent of nuclear weapons - said he would never launch a "first strike" attack as prime minister and wanted to de-escalate global tensions, working with other countries including the US, Russia and Iran. Pressed on whether a commitment to renew Trident would be in Labour's election manifesto, he replied: "We are having that discussion within the Labour Party and we will publish our manifesto in May. "We will have a strategic defence review immediately which will include all aspects of defence. We would then look at the situation at that time." Nuclear weapons, he insisted, were not a solution to the world's problems, adding: "I have made clear there would be no first use of it and that any use of nuclear weapons would be a disaster for the world." Mr Corbyn is the first Labour leader to support unilateral nuclear disarmament since Michael Foot in 1983 - a stance which puts him at odds with the bulk of his party. Most of his MPs, including his deputy and defence spokeswoman, back the "continuous-at-sea deterrent" while unions say scrapping it would be bad for jobs. MPs overwhelmingly voted earlier this year to build four new submarines to carry missiles armed with nuclear warheads. They are intended to replace the existing Vanguard fleet from the early 2030s at an estimated cost of £31bn. Several hours after Mr Corbyn's interview, Labour released a statement saying "the decision to renew Trident has been taken and Labour supports that". Expanding on his foreign policy priorities, Mr Corbyn said he supported Nato and wanted to boost the UK's conventional armed forces but would be seeking a better relationship with Russia. Asked whether he would approve a potential drone strike to kill the leader of the so-called Islamic State group, he said Abu Bakr al-Baghdadi "not being around would be helpful". But he said he would first want to see the intelligence available and understand what a move would achieve in terms of ending the conflict in Syria, in which he said innocent civilians continued to die in bombing raids. On the question of Europe, he acknowledged that the free movement of European citizens into the UK would end after Brexit, since it was an "intrinsic" feature of EU membership. Asked if he would insist on it ending if he was PM, Mr Corbyn said he would "insist on trade access and see what follows from that". But he rejected claims that his stance on Brexit was indistinguishable from Theresa May's, saying he was seeking an "intelligent" relationship based on tariff-free access to the single market. In the domestic sphere, he said he was "fed up" with inequality and under-investment and would use the power of the government to improve housing and education and phase out private contracts in the NHS. He said he would like to see all grammar schools turned into comprehensives but said this could only be decided at a "local" level. And asked whether he believed he could win the snap 8 June poll, he replied "watch this space". The Conservatives said only Theresa May was offering "strong and stable" leadership. "This morning we learnt that Jeremy Corbyn would refuse to strike against terrorists, dismantle our nuclear defences and fail to control our borders," said Home Secretary Amber Rudd.